Scroll down to read many articles, charts, and diagrams on Fibromyalgia as well as information on SSA Rulings, links to a large variety of websites all over the internet. There is a wealth of information out there on CRPS so rather than try to reinvent the wheel and re-write all of this information on Fibromyalgia we have simply provided the links to these excellent websites for you below. They will give you a starting point in your educational journey. When we begin tp understand our illnesses the less they are in control of our lives and the quicker we reclaim them and move forward again. Once again WebMD shows why they are such an amazing source of information on all things medical. If you click on the SLIDESHOW above it will take you directly to their 21-slide presentation on the disease that affects more than Five Million Americans, many of them happen to also be suffering from CRPS already. Besides the information there are some great photographs and diagrams that help you﻿ understand this disease that is often confused with CRPS. Here are three excellent diagrams showing the Tender Points of Fibromyalgia. 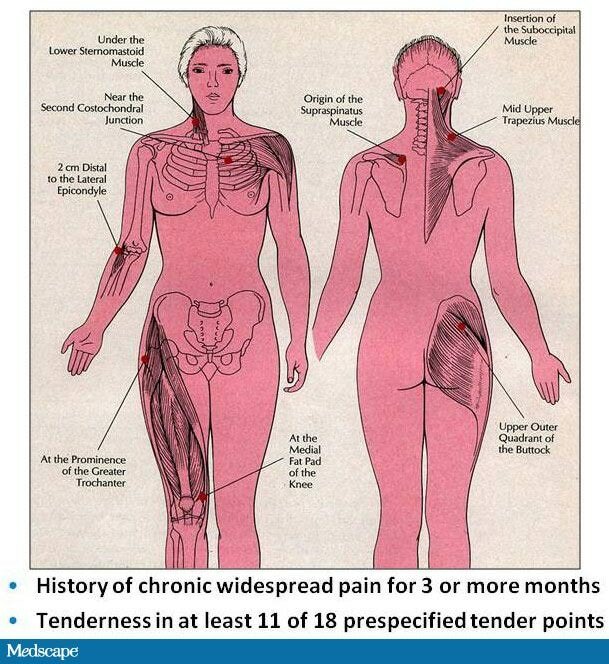 The Tender Points are critical for a Diagnosis of Fibromyalgia and for a patient they are some of the most painful parts of the disease, obviously. But if you ask a fibro patient what the most difficult symptom is to deal with most of them will tell you it is the overwhelming fatigue. Imagine walking from Florida to Maine without stopping, in the rain, with a 60 pound backpack on, and dragging six people behind you, and deali﻿ng with pain in most of your joints, shoulders, arms, neck, knees, etc., and feeling like you have the flu, and never sleeping, and dealing with cognitive issues. Then turning around and doing it again. And again. And again. Then top it off with a flare every few weeks. This gives you an idea of what Fibromyalgia is like. There are other symptoms of course. Please check out the information that we have put together in this section to learn much more about this disease. I have had Fibro for about 13 years now, in addition to my other diseases. It has been quite a ride! 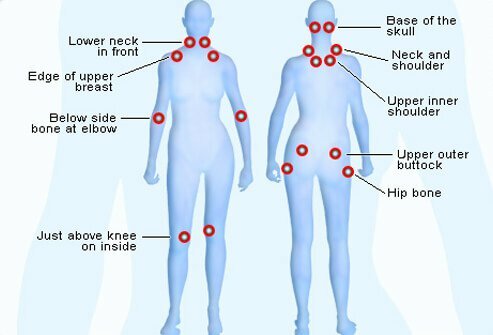 Fibromyalgia Flares: Triggers, Symptoms & Coping - From the About.com website, in the Health section. Fantastic website and their Fibromyalgia and Chronic Fatigue Syndrome (CFS) section is excellent. Many CRPS patients can develop one or both of these conditions. Myths and Facts and Fibromyalgia - From Fibrocenter! Possible Genetic Causes/Links for Fibromyalgia? - About.com, health section discusses possible genetic causes of FMS/CFS but what does genetic predisposition mean exactly? Selecting the Right Doctor - Fibro Center helps you understand how selecting the right Doctor makes a world of difference in not only getting the correct diagnosis but in being treating with the right therapy and medications quickly and with kindness. No one wants to hear "It's all in your head." Fibromyalgia "Risk" Factors - About.com discusses possible "Risk" factors you might want to think about. Do they fit you? Social Security Ruling For Fibromyalgia! July 2012 - The SSA has passed a Ruling dealing specifically with Fibromyalgia. What does that mean exactly? The Ruling was passed in September of 2012 but this article was only written in September of 2013. For more details check out the article that Keith Orsini of American RSDHope wrote in his blog, the link is below. Social Security Administration passes new Disability Ruling for those with Fibromyalgia! This Social Security Ruling (SSR) provides guidance on how we develop evidence to establish that a person has a medically determinable impairment (MDI) of fibromyalgia (FM), and how we evaluate FM in disability claims and continuing disability reviews under titles II and XVI of the Social Security Act (Act). Effective date was July 25, 2012. There's some important news for millions of people -- most of them women -- who suffer from the syndrome fibromyalgia: a new study suggests that sleep deprivation is associated with an increased risk of developing fibromyalgia. It's important to make clear that this study does not prove that sleep deficiencies cause fibromyalgia. What it does do -- for the first time -- is establish a strong connection between sleep problems and fibromyalgia, by showing the increased risk of fibromyalgia that is associated with lack of sleep. Please click on the link above to read the article in its' entirety. it is a great read! There is a quote on there that I love and can definitely relate to, "I want to sleep but my brain won't stop talking to itself!" The symptoms of fibromyalgia are similar to many other diseases. Jackie Yencha hit the wall at age 22. "I couldn't handle the pain any more," she says. "I was terribly fatigued, not feeling well, not sleeping well." But it took Yencha seven years to get an accurate diagnosis of fibromyalgia. Her first diagnosis -- reflex sympathetic dystrophy -- resulted in experimental surgery that did nothing to relieve her pain. In fact, numerous surgeries followed to correct the problems from that procedure. Years went by. Yencha was still in pain, still getting little sleep. "I became desperate ... the pain never got better," Yencha tells WebMD. That's when she headed to the Cleveland Clinic, where comprehensive testing showed she had fibromyalgia. "You need to find a doctor who will listen and who really knows fibromyalgia," says Yencha, who is now vice president of National Fibromyalgia Partnership, a nonprofit organization that fosters education about this disorder. "A lot of doctors out there don't know much about it," she explains. "We hear from people all the time ... people in small towns who say no one here has ever heard of this." Fibromyalgia is a chronic condition that causes disabling pain all over the body -- as well as stiffness and tenderness in muscles, tendons, and joints, experts say. It is most common among women ages 35 to 55. Although it's one of the most common muscle problems, the cause is a mystery, fibromyalgia researchers say. There is no inflammation or joint damage, as occurs with arthritis. There is no damage to internal body organs, as with rheumatoid conditions like lupus. It is called fibromyalgia syndrome because it is identified by a collection of symptoms. But these are also common to liver disease, lupus, Lyme disease, thyroid dysfunction, heart disease, arthritis, degenerative joint disease, chronic fatigue syndrome, irritable bowel syndrome, and other disorders -- and therein lies the difficulty in diagnosing fibromyalgia. How fibromyalgia develops is also a mystery. " Please click on the link to read the rest of the story! As with chronic pain, sleep problems are common -- and it's not always easy diagnosing fibromyalgia syndrome as the problem. "The primary care doctor is at somewhat a disadvantage," Berney tells WebMD. "There are no specific tests for fibromyalgia diagnosis. To make a diagnosis, one has to make sure it's not something else -- lupus, thyroid dysfunction, rheumatoid arthritis. The list of possible diseases associated with these symptoms is fairly extensive. It's the vagueness of the symptoms that delays the diagnosis." "You won't necessarily have all of the symptoms of these disorders, but you can have a component of each," says Grabois. "Patients often go to a lot of doctors trying to figure out what's wrong. The doctors are not familiar with fibromyalgia syndrome so they don't necessarily know the diagnostic criteria for it -- and they don't necessarily check for it." Also, the level of misery is different for each patient, he points out. "Some have pain worse than others." For some, the pain is continuous. For others, it comes and goes. Some people wake up feeling like they have been exercising all night. If you have seen several doctors -- yet still don't have relief -- see a specialist, Grabois advises. The National Fibromyalgia Association provides a list of specialists who understand the disease -- experts in pain management, rheumatology, and neurology. What your symptoms are -- and when they started. How long they've been going on -- and whether it's been continuous, or off and on. Have you noticed any triggers for your symptoms? How do your symptoms affect you? Is pain sharp, a dull ache, does it cause nausea? How do symptoms affect your feelings? Does pain make you depressed or anxious? How do symptoms affect your work or home life? Are you very fatigued and can't do normal activities? What drugs, herbal remedies or supplements are you taking? What current treatments has another doctor or specialist prescribed? Getting a Correct Diagnosis continued... Keep a pain journal. "Doctors will listen more if you keep a daily record of how you feel -- even if it's just for one month or for three months," says Yencha. In your pain journal, make note of intensity of pain (on a scale of 1 to 10), what you were doing at the time, and how you felt emotionally. It will help you and your doctor see patterns in the pain, she says. There are no lab tests or scans that can help doctors diagnose fibromyalgia. But various blood tests can help them rule out other medical conditions. Some patients need to have respiratory problems checked or get a sleep apnea study, Berney says. "On occasion, the problem is sleep apnea or snoring, both of which disturb sleep." Find the right doctor. It's important to find a doctor who cares about you -- and wants to help you, says Mary Rose, PsyD, clinical psychologist and behavioral sleep specialist at Baylor College of Medicine in Houston. "It's very common, physicians having very little time. Sometimes they don't really hear everything a patient says." Never stay with a physician you don't like or trust, Rose tells WebMD. "It's not all in your head -- and while you may be depressed, depression is not the whole picture of fibromyalgia. We see depression with cancer, cardiac disease, and we know those are real. Pain is very frustrating. In the medical community, we probably don't have the empathy for pain that we should." Get emotional support. A therapist's support can be helpful when you're dealing with fibromyalgia, Rose notes. "Fibromyalgia has such a stigma. Sometimes it is really helpful to see a therapist -- not because you're crazy, but because you have to deal with pressure and stigma. It's nice to have someone objective to talk to." Say goodbye to tender points? The Symptom Intensity Scale score can be used to identify and quantify fibromyalgia syndrome from information supplied by a simple questionnaire. In this paper, the author describes how this test was developed and argues in favor of its use in clinical practice in diagnosing fibro- myalgia syndrome. The Symptom Intensity Scale questionnaire consists of two parts: a list of 19 anatomic areas in which the patient is asked if he or she feels pain (the total number of yes answers being the Regional Pain Scale score), and a visual analogue scale for fatigue. According to the Survey Criteria, a diagnosis of fibromyal- gia can be entertained if the Regional Pain Scale score is 8 points or higher and the fatigue visual analogue scale score is 6 cm or higher. The number of tender points, a surrogate for diffuse pain, does not fully capture the essence of fibromyalgia syn- drome, in which accompanying fatigue is often severe and nearly always present. The Symptom Intensity Scale is an accurate surrogate mea- sure for general health, depression, disability, and death. Fibromyalgia syndrome diagnosed with this instrument implies that this illness carries increased medical risk. This is a very intensive and extensive article that we highly recommend reading. You can read it in its' entirety by clicking on the link below. ALSO SEE - CRPS OR FIBROMYALGIA ? - By Keith Orsini of American RSDHope - Can the two diseases be confused? Can you have the two diseases at the same time? Yes and yes. As you can read by the descriptions below there are similarities in the symptoms but the causes are much different.